Check out our newest cabinet sample. This gorgeous oak Wine Bar TV lift cabinet has never been used. The TV lift cabinet doubles as a wine bar. 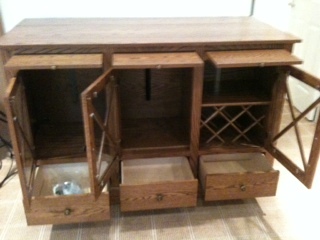 It has a wine rack down below and storage for glasses. There is also three pull out cutting boards to slice cheese, limes, or use as a serving tray. The bottom three drawers pull out for extra storage. There is an Uplift 3700 lift mechanism inside to accommodate up to a 55” TV. The cabinet dimensions are 60”W x 27 1/2” D x 38 7/8” H. This sample is being sold “as is” condition for only $2000. Normally, this large cabinet would sell for well over $2500. As this is a sample model we only have this one to sell. Hurry and be the first to claim it! Call our office at 561-417-0999 to place order.